The Sateon system is configurable with most third party security and building management solutions; from CCTV to fire alarms, HR and Student databases. Sateon Enterprise already integrates seamlessly with an ever growing list to provide safe, low energy and secure environments that require very little management. Whether installing Sateon from scratch or upgrading, an integrated Sateon Enterprise system will give you more control and greater peace of mind. Already have CCTV in place? Don’t worry about managing multiple systems, Sateon integrated Access Control will do the work for you. Suspicious activities picked up by Sateon are communicated to third-party video management software which reacts and replies to Sateon with the area in question displayed on a screen. View a live video stream, review historic CCTV images and control your CCTV system directly, sending commands to manage the controller and cameras. Integrate Sateon with your lift system and take your access control solution to a new level. A number of options are available depending on your requirements. Card readers can be installed on the outside of the lift which restricts access to only those who have valid cards. 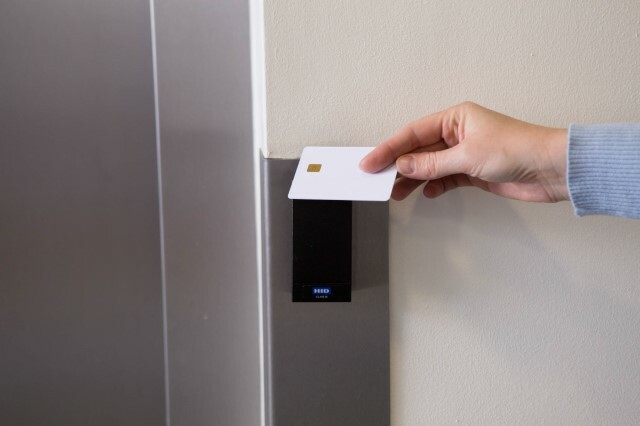 Each card can be individually tailored depending on the person carrying it, with options including default floor only restrictions, giving the card user access to a range of authorised floors or giving full access rights. This is particularly useful in multi-tenanted buildings such as the Gherkin, where floor access is restricted to certain individuals. Not only do individuals have tailored access rights, but the duration for access can also be applied providing an extra dimension to your security. This integrated access control not only offers you the range of options described above but also the convenience of a system which allows you to view the lift status and any anomalies in a ‘one-stop-shop’ display screen. Read how Cambridge Consultants made this an active part of their security system. Sateon Enterprise can be programmed to react to a fire alarm and produce muster reports that can be automatically emailed, printed or text to a fire marshal, unlocking doors to allow for an easy and safe evacuation, turning on sprinkler systems and making sure pathways to fire exits are lit. Any alarms raised will be displayed on screen via the Enterprise Control Panel map, and pre-programmed reactions let you assess and manage the situation accordingly. Examples could include rotating CCTV cameras to the area where the alarm was triggered so as to record or view the event. Integrated with your BMS via Bacnet and PSIM protocol, Sateon can ensure building processes are streamlined to ensure that your building’s facilities such as lighting, heating and ventilation are only on when the building is occupied. By switching off lights and minimising HVAC demand as the last member of staff leaves at the end of a working day Sateon helps deliver on corporate and social responsibility commitments while ensuring reduced energy costs. Put Sateon Enterprise at the centre of your management systems, by integrating it into a range of third party databases. The Database Gateway allows personnel and token data to be imported from visitor databases, HR databases such as SAP and student databases such as the School Information Management System (SIMS), a database commonly used in the education sector. This means you only have to enter data once, saving you hours of typing information into separate systems and minimising the risk of human error. Access rights and other useful information can be allocated to individuals giving you a system that flags up any issues that are on the horizon and allowing you to act on these in a timely manner. Data can be deleted, events logged and comprehensive reports produced, all saving time and duplication while maintaining a risk-free environment throughout, allowing for a more economical and effective system and ultimately increased security. Brunel University London took full advantage of the Database Gateway; reducing duplication of tasks and increasing the accuracy of data and security; read more here. Our latest integration into wireless locks opens Sateon into the burgeoning offline wireless market, dramatically reducing the time and cost associated with installing hard-wired projects and representing a sizeable and profitable opportunity for our partners. Sateon integrates with databases of third-party systems to provide a single view of all locks, users and access. This integration can be used with iClass, Mifare and Desfire card technologies.